Definition: The Queuing Theory, also called as a Waiting Line Theory was proposed by A.K. Erlang. According to him, the queuing theory applies to those situations where a customer comes to a service station to avail the services and wait for some time (occasionally) before availing it and then leave the system after getting the service. The situations where the arrived and departure problems can be seen: people waiting to deposit the electricity bills, flow of automobile traffic through a road network, queues formed at the ticket counters, people waiting to make deposits or withdrawals at bank, machines waiting to get repaired in the workshops, etc. The waiting lines are formed due to the inefficiency of the service system to render immediate services to the customer when they arrive. If the customer has to wait for a long duration, it might lead to the frustration among them, the goodwill might get damaged, direct cost of idle server- in the case of poor coordination may arise, etc. The demands of a person can only be met by increasing the service capacity, or enhancing the efficiency of the existing elements in the service systems. But however, adding too much capacity may be a costly affair as it may lead to the increased idle time on the part of the server in case of a few or no customers. Also, the setup cost would be too high. 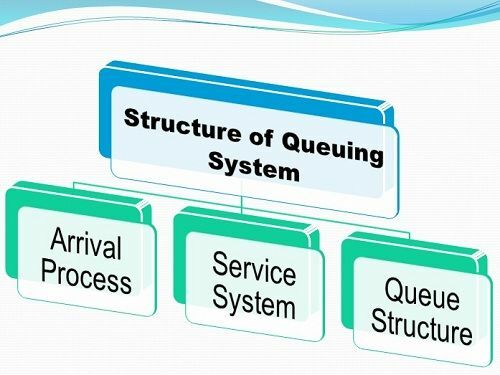 Thus, the ultimate goal of the queuing theory is to achieve an economic balance between the cost of rendering services and the cost associated with the waiting time. Having a virtual customer queuing system would probably help ensure that people are all able to be attended to as they come. Queuing theory is interesting since lines are a natural result of not having enough people. I think that this article brings up a great point when it says that a manager has to decide what the optimal level of service is.